Discussion in 'Translations' started by abu Hasan, Nov 26, 2016.
one 'waaw' was missing in the arabic text. it has been added now and the newer images uploaded. please download the corrected version. also please inform us of any other mistakes you may find. Ghulam Ali, Unbeknown and Noori like this. Alahazrat's magnum opus, Fatawa Ridawiyyah begins with a beautiful preface. The opening praise of Allah ta'ala and blessings upon the Prophet sallAllahu alayhi wa sallam [hamd and salawat] are both composed using the names of books, imams and appellations. 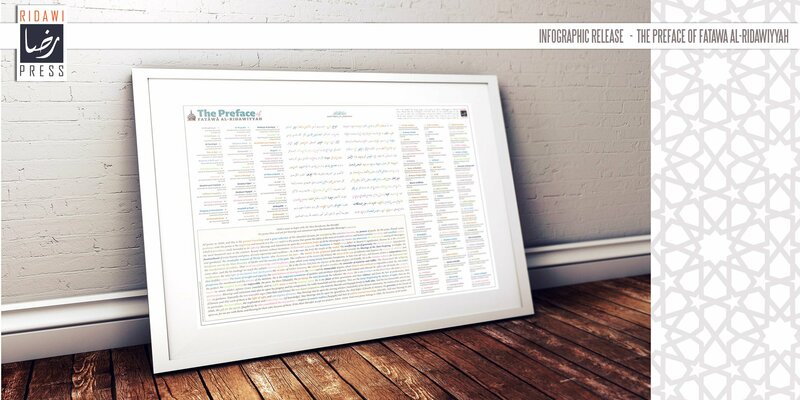 This infographic lists the names, along with the authors of books mentioned, a mapped color coded translation will in sha Allah help us appreciate the eloquence and brilliance of this masterpiece. subHan Allah ! MissHussain, abu Usman, AbdalQadir and 9 others like this.